MK2 (or MAPKAPK2) was already known for its role in the inflammatory response, however recent studies indicate the involvement of this protein kinase in the DNA damage response mechanism. Within its kinase family the enzyme MK3 shows the highest identity with MK2. Here we report a theoretical study on the binding of two molecules, 05B and P4O, to the proteins MK2 and MK3. 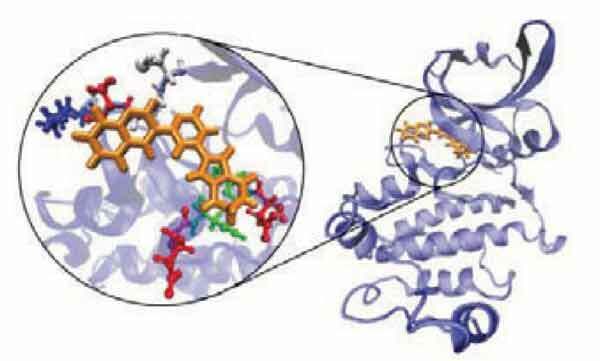 The data here obtained may shed light on the contribution of individual residues and binding site water molecules for the binding of potential inhibitors to these two kinases. Cell cycle checkpoints, DNA damage response (DDR), Enzyme-inhibitor interactions, MK2, MK3, Semi-empirical calculations. Centro de Investigacao em Química, Departamento de Química e Bioquímica, Faculdade de Ciência da Universidade do Porto, R. Campo Alegre 687, 4169-007 Porto, Portugal.